1. Blogging helps you learn new things. Before Abby started blogging, she didn’t know much about photography, but through the weekly habit of taking pictures, editing, and then posting them to the blog, she’s become a very good photographer. Before I started helping Abby with her blog, I didn’t know much about WordPress, themes, HTML, or CSS, but after a few years of helping with some technical aspects of the blog, I slowly picked up some of these skills and countless others. 2. Blogging teaches you to be a better writer. They say there’s no better way to learn than by doing — and if that’s true, then bloggers naturally become better writers over time. Abby has always been a great writer, but I’m sure she’s even better now after hundreds and hundreds of posts. I’ve never been a great writer, but I’ve certainly improved after writing posts, eBooks, and training material on a consistent basis. Expressing yourself through writing is an important skill that can give you a major advantage in life, and blogging can help you improve in this area. 3. Blogging can help you make money. Making money was the furthest thing from our minds when Abby asked me to register a domain name for her and install WordPress at the beginning of 2013, but over time you begin to realize that it’s possible to earn money from a blog. At first, it was a few dollars a month, then a few hundred, occasionally a few thousand, and now it’s a multi-six-figure income for our family. Wow! I can’t think of a more fun and satisfying way to earn a living. It doesn’t happen overnight, but it is possible. 4. Blogging can be used to support a good cause. Do you have a cause or charity you are passionate about? If so, blogging can be used to raise awareness, gather support, raise money, and generally promote the cause. What a great opportunity. This is an area Abby and I may start to explore in the future. Right now we donate to our church and a variety of other non-profits. If it makes sense in the future, Abby may use her platform to support a good cause. It’s nice to have that option. 5. It’s easy to start a blog. What may seem confusing at first is actually quite simple — getting a blog up and running can happen in as little as 10 minutes if you’re following a good tutorial. Don’t let the technical stuff scare you! It really is easy to start a blog. 6. Blogging consistently teaches discipline. It’s one thing to stay consistent and dedicated to something when nobody’s watching, but staying consistent when you have an audience is something else altogether. The pressure of posting consistently for your readers will teach you discipline. 7. Blogging can help you build an audience and give you influence. While the reasons behind the desire to build an online audience may vary, there’s no denying that blogging can help build that audience and give you influence within a sphere of people. Having influence over an audience is a great way to make an impact. Blogging can help you do that. 8. You can help other people by blogging. Some people like to say that a business is a solution to a problem. I agree. Blogging can also be a business when you help people by giving them a solution to their problem. Help your audience by writing with their needs in mind, and you’ll go far. 9. Blogging can help you stay in touch. Maybe you’re not interested in blogging as a business, but instead, you’d like a way to stay in touch with family and friends. Blogging is great for this. You would be surprised, however, that many people start a personal blog for this purpose but find out later that other people have found the site and were also interested in the personal stories, lessons, and life updates. An example of this would be challies.com. Tim started his blog over a decade ago as a way to keep his family up to date and work on his writing. He slowly gained momentum and now he runs the largest Christian blog in the world. You never know where a simple “stay in touch” or “family update” type of blog can take you. 10. Blogging can promote an offline business. Do you have an offline business? Maybe a bakery, accounting practice, babysitting service, lawn care, or anything else. Blogging can be used as a marketing channel to promote that business. When you provide helpful answers in the form of blog posts to potential customers that are asking questions, you have the opportunity to gain a lot of traction and have an effective online marketing channel for your offline business. 11. Blogging is a creative outlet. Too often we spend our time consuming — TV, Netflix, magazines, radio, movies, etc. It’s more work, but being creative instead is much more satisfying. Writing or sharing your creative work through a blog is a tremendous creative outlet. 12. Blogging full time can give you freedom. Recently our school district went on strike, and our first grader was home with Abby and I instead of being at school. Some of our friends had to scramble to find daycare or babysitting for their child. Abby and I realize we are fortunate that having our oldest home for a few weeks was more of a pleasant surprise than a difficulty we had to overcome. Our jobs are flexible and we can work from home, a coffee shop, or even while on vacation if we wish. Blogging has given us a tremendous amount of freedom. 13. Blogging allows you to document your life. In decades and centuries past, it was common to keep a physical diary of one’s life. These sometimes become priceless treasures to the family as they read about their relatives’ past adventures and observations. A personal blog is a modern twist on the old pen and paper journal. It’s a great way to document your life for personal reflection or even posterity. 14. Blogging helps you meet new people. Abby, in particular, has met dozens of people where their relationship started as online “blogging” relationships but soon moved to the offline friend category after meeting at conferences and other real life events. Bloggers understand other bloggers, and there’s usually an instant connection because of this shared commonality. Blogging is a great way to meet new people and develop new relationships with interesting and influential people. 15. Blogging can inspire others. Abby and I publish our blogging income reports each month for a couple of reasons. One is to validate our experience. We make an effort to teach others how we built a successful blog, and seeing the income can help to validate this experience. Another reason we publish the income reports is to inspire others. We know there are a lot of incredibly talented people out there who feel stuck in their current job, or maybe they are at home with their kids during the day and they don’t realize there are income opportunities online that don’t take you away from your family. We try to inspire those interested into exploring the blogging path. 16. Blogging is an alternative business model. This is a concept I’ve learned from Corbett Barr at Fizzle.co — In the past, businesses were built by identifying a problem, creating a solution, and then hopefully attracting customers. Blogging has flipped this business model on its head. It’s possible to create a business with an alternative path of building an audience first, then identifying their problems, and finally creating a solution they will pay for. There are tremendous advantages to this new model! Instead of hoping and praying people will like your solution or actually having the identified problem you are trying to solve, you now have an audience and can ask them directly what problems they have and what they are struggling with. 17. Blogging helps to build a personal brand. Increasingly, consumers like to connect with people rather than companies. I know personally that I like to do business with people I know. For instance, I followed a fellow blogger named Nathan Barry for years — I read all of his posts, bought his books, and joined all of his courses. Eventually, he started an email marketing company called ConvertKit. I was immediately attracted to the software because I felt like I knew the owner. Nathan had spent years building a personal brand and because of that, I was more likely to do business with him in the future. Maybe you can’t see exactly why your personal brand is important, but years down the line no matter what line of business you are in, your personal brand can become a huge advantage. One of the best ways to build this personal brand is through blogging. 18. Blogging is a way to tell your unique story. Everyone has a unique perspective. Sure, there are thousands of other blogs about organizing, decorating, or even starting a blog. But you need to remember that none of those other blogs have your unique perspective. Just because something has been taught before doesn’t mean you can’t teach the same thing. You’ll connect with a different group of people as you weave your story and your experiences into what you are teaching. You have a unique story and perspective — make sure that comes through in your writing. 19. Blogging is a way to validate expertise. How many times have you been contacted on Twitter or through email by some self-proclaimed “social media expert” offering to help 10x your traffic with their strategies? Do you pay attention to these offers? I sure don’t. Unless someone is willing to validate their expertise (usually in the form of insanely helpful and valuable blog posts), I don’t do business with them. It’s easy to say you’re an expert in a given field, it’s another thing altogether to demonstrate your expertise. Blogging is a fantastic way of doing this. 20. Blogging takes you out of your comfort zone. Abby describes her former self as “the girl who was scared of everything.” The only reason she could even bring herself to push “publish” on her first post on Just a Girl and Her Blog is because she told herself no one would ever read it. In the past few years, Abby has made hundreds of friends through blogging. She’s pitched to and worked with brands like IKEA and Behr. She’s attended (and spoken at) blog conferences. She’s led webinars and done video interviews and podcasts. And she loves every minute of it. Blogging took her out of her comfort zone and gave her confidence in her abilities, and it has been really fun to see her grow over the past few years. You’ve convinced me to start a blog… where do I go from here? You may not resonate with all the examples and reasons to start a blog, but I’m sure you all resonated with a few. There’s no better time than now to get started in this blogging adventure. If you want to avoid some common mistakes and get started blogging in no time, you can follow this tutorial. I think you’ll be glad you did! A lot of stuff here that I never though about! How do I find a niche/ sub niche? It can definitely be tough to settle into a niche! I was kind of like you. When I first started, I blogged about allllll the things. As I wrote more and more, I found that I liked the home decor stuff the best. And as I kept writing and publishing posts, I realized that what I really, really liked was home decor with an organization bent. When I looked at my analytics, they reflected that as well– many of my popular posts were in the organization category. So I would say pay attention to what you’re enjoying the most and what your readers are responding to and then head in that direction! And it can change sometimes too! For a while I had a heavy blogging focus too, but that has currently scaled back a bit in favor of some other projects. It will ebb and flow as your life and interests change, but I think if you pay attention to what you’re passionate about and what is important to your readers, you will find your groove! I hope this helps! Amazing article for newbie bloggers. Definitely recommending it to all my fellow bloggers! I need help! I’m 56 years old and not very computer smart. But this has always been a passion of mine. I’m scared to pieces. I want to blog about all the Great Smoky Mountains National Park where I live. All about the hidden treasures here. The campgrounds, restaurants and shopping and everyday life. But I’m so scared. Don’t know where to begin. Hi, Susan! 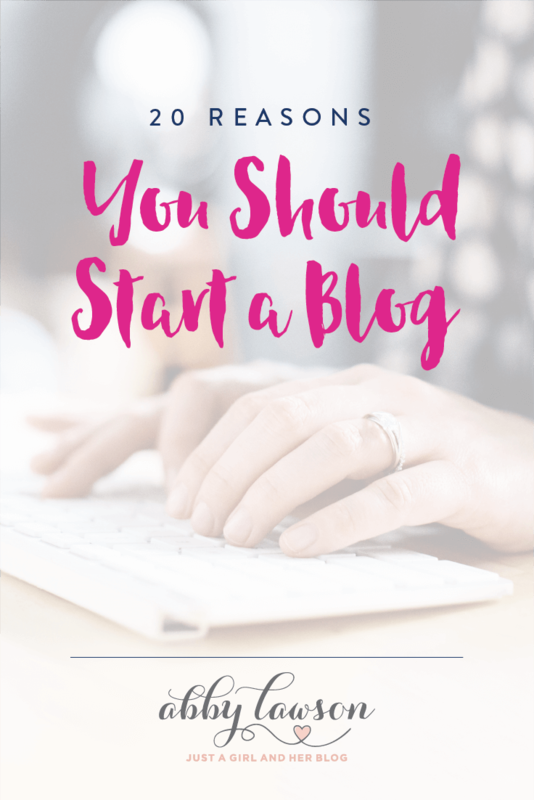 We have a very detailed post about getting started here: https://justagirlandherblog.com/start-a-blog/ . Best of luck with your site! These are great reasons and many of them are exactly why I’ve decided to start a blog. The perks are endless!